Bryan came to me after cruising my website and exclaiming that he wanted to work with “the real estate maven.” Buying a house in Port St Lucie fit into his five year plan and he knew the basics of what he wanted. The location that he desired was in the Gatlin / Rosser Blvd area with access to Becker Road so that he could take the back roads to Stuart where he works. Our first Saturday of touring was a success and he made an offer on a property but unfortunately got beat out by someone else. The second Saturday was another success in that he found a never-lived-in three bedroom home in the area that he wanted. The closing happened in September and Bryan and his dalmation dog have sinced moved in and are enjoying their new space. 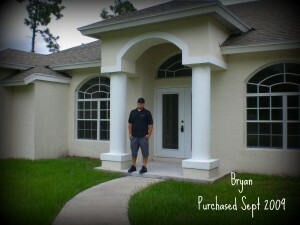 Best wishes to Bryan and his new diggs!